White Buffing pad 17" (44cm), for light polishing and general regular maintenance cleaning of polished stone surfaces. Can be used in conjunction with Neutral Tile Cleaner or Stone Soap. 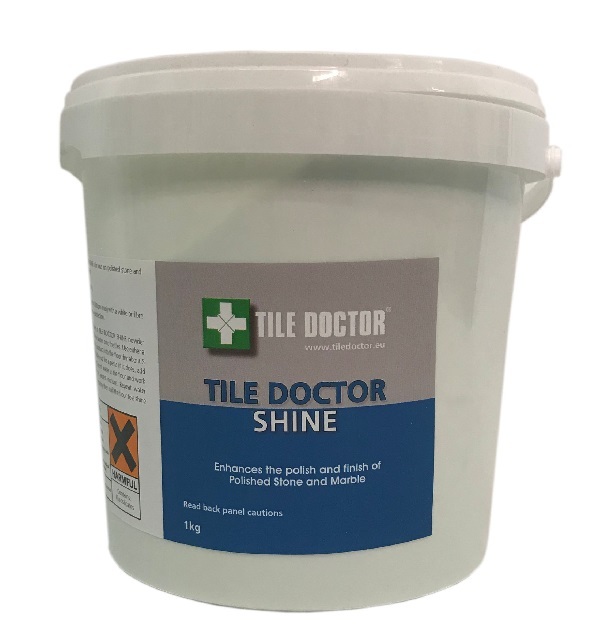 Tile Doctor Shine is a crystallising powder that provides a very high shine and tough durable finish. Use for sealing all natural stone (such as granite, limestone, marble, slate and travertine), porcelain, quarry, saltillo, terracotta, cement pavers, masonry surfaces and other porous tile, stone and grout where a natural look is desired. Effective for interior and exterior applications. Apply 20 grams of Powder to 1m² of floor. Use a slow speed floor rotary machine (200rpm max.) fitted with a White or Tan buffing pad. Place at least 1/2 litre of water onto the floor and work product into floor for three to five minutes. The resulting mixture when working the floor should be a green watery solution. Do not allow product to thicken up like a cream. Do not let the mixture dry out under floor machine. Remove any fluid and after the floor has dried polish with a rotary machine fitted with a white buffing pad, some spray burnishing may be required to release stubborn marks. A one litre bottle will cover approximately 7.5m² to 35m² (75 to 375 sq. ft.) per coat, depending on type of stone, tile, porosity and texture of surface, temperature, humidity, and method of application. Available in 1kg tubs at £30.00 each, Postage and Packing £5.50 for a 1kg tub, £10.00 for 2 or more kg (All prices are shown inclusive of VAT).